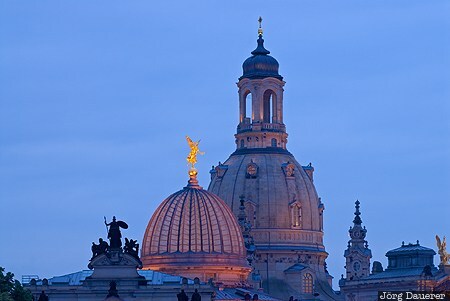 The floodlit cupola of Frauenkirche in Dresden behind the illuminated glass cupola of Dresden Academy of Fine Arts at the blue hour after sunset. Dresden is the capital of Saxony (Sachsen) in the east of Germany. This photo was taken in the evening of a rainy day in June of 2009. This photo was taken with a digital camera.